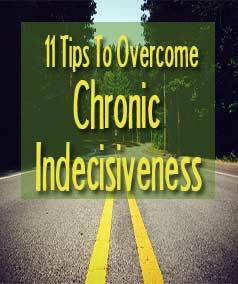 11 Tips To Overcome Chronic Indecisiveness - Better Believe It! There are so many decisions to make every day, from the small, insignificant ones to those nail-biting, major, life-changing ones. 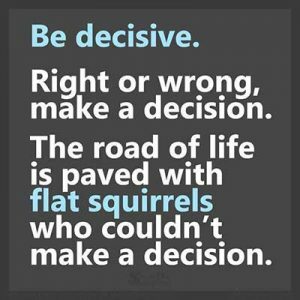 Some people seemingly have no trouble making decisions day in and day out, but then there are those who suffer from chronic indecisiveness. 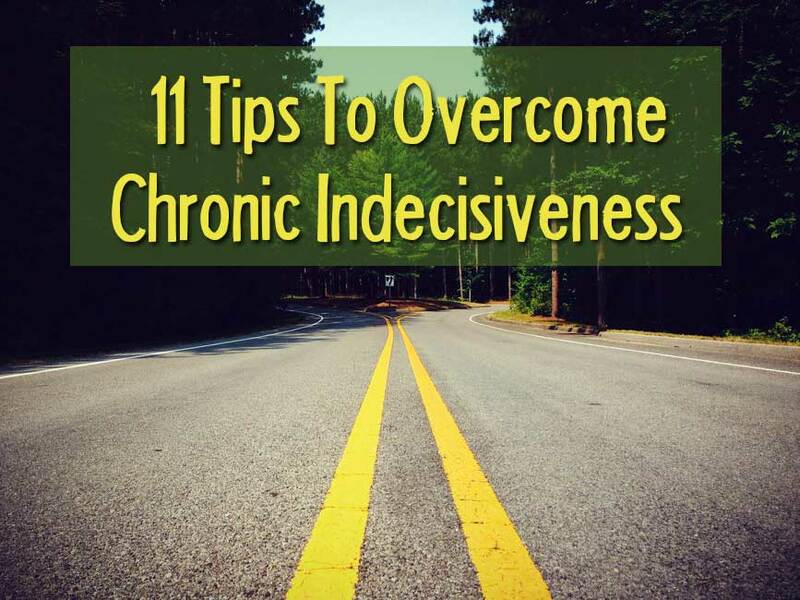 Here are 11 tips to help overcome that chronic indecisiveness that results in anxiety, despair, and well, cognitive paralysis. From the moment you wake up in the morning, you’re already forced to start making decisions. Should I hit the snooze button and sleep a little more? If you get up, you have to decide what to wear, whether to eat breakfast, and if so, what to prepare. And the ball just keeps rolling throughout the day, as you decide on all those small choices that present themselves. Then there are the whoppers. Should I move? Where should I live? Should I get a different job? Should I enroll in school? Who should I choose to marry or live with? 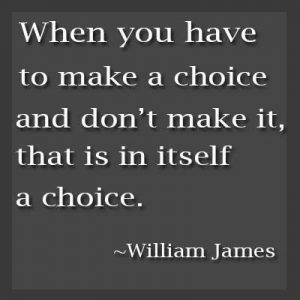 People who suffer from chronic indecisiveness have trouble making these numerous decisions. They may procrastinate on making any decision, they might spend inordinate amounts of time thinking, pondering, mentally going around in circles as they weigh their options. Not making decisions also makes people feel bad. Their self-confidence and self-esteem takes a hit when they waver endlessly and him-haw around. If you find it difficult to make decisions, take heart. Everyone suffers from it at some point in their lives, even those people who have lots of fame, money, and high=powered careers. When you get stuck, try implementing these 11 methods to overcome and make a confident decision. If you’re making a big decision, you need to get the pros and cons down on paper (or written digitally). Once you get them out of your head, you can see them better and evaluate them more easily. But you need to also give weight to each pro and con, as some will be more important to you than others. A student at the Hong Kong Polytechnic Institute has created a useful online calculator to help you make a weighted list. You can find it here. This sort of goes with the weighted part of the previous tip. Take a few minutes to write down who you are, what you want out of life, what kind of person you define yourself to be. Know your values. Recognize what you’ll tolerate and what you won’t. It sounds simple, but if you know and remember your core values, it acts as a reminder, or a sort of roadmap or compass, that makes your decisions a bit easier. When you make decisions that are aligned with who you truly are, they end up being better, more satisfying decisions later on down the road. We tend to think that having more choices is better, but studies show that limiting the number of options helps us make better decisions and offers us more satisfaction after the decision has been made. In three separate experiments, the researchers found that having 6 or less options (as opposed to 24) helped people make decisions better, and made them feel more satisfied with their decisions. Also, Barry Schwartz goes into great detail about this in his book, Paradox of Choice. Mr. Schwartz says, “Clinging tenaciously to all the choices available to us contributes to bad decisions, to anxiety, stress, and dissatisfaction — even to clinical depression.” He details why fewer options are better for us. Try to narrow your options down to about 2-3 options, but definitely less than 6. Try to figure out why you’re having a difficult time making a decision. Do any of these scenarios apply to you? Afraid you’ll go against what other people think or want? A common reason for not being able to make a decision is because someone else wants something different than you, or you’re worried about how others will feel or react. Know that this is your life, and your decision. Believe me, they’ll adapt and get over it. Do what’s best for you. People suffering from depression, chronic anxiety, or other psychological disorders tend to have more difficulty in making decisions. If you are afflicted, seek professional help. And in the meantime, use the tips presented here to take action anyway. When, no matter what you choose, all the options are bad, it can be difficult to decide. Just know that sometimes, such is life. Just choose the “lesser of the evils” and go with it. All choices are fairly equal. When all your options have relatively the same outcome, it can be quite difficult to choose. Acknowledge this block, then apply the tips presented here and decide. This is a big one for a lot of people. No one wants to fail, but for some people, the prospect of failure can be paralyzing. Realize that failure is a part of life. It doesn’t make you “less than”. Some of the greatest lessons come from failure. Failure can be a great stepping stone to something even greater. Don’t be afraid to fail. Besides, you never fail until you give up trying. If something doesn’t go right, pick yourself up, make a course correction, and carry on. No big deal! Perfectionists can face real difficulty in making decisions because they feel that they have to make the perfect decision. This is tied in with the previous tip (fear of failure). In fact, there are no “perfect” decisions. Let go and just make the best decision you can right now. Sometimes your subconscious mind knows things that your conscious mind is blocking out, and you can get in touch with this area of knowledge by literally listening to your gut. Think about each option you have, and when you do, notice the sensations in your body. Does your stomach clench up? Do you feel tightness in your chest? Does your breathing change slightly? The signs are subtle, but they’re there. Sit in a quiet place and feel all the sensations in your body. Sometimes we get trapped in the mind – and it just keeps going and going and going like the little Energizer bunny. If you find yourself just thinking it over, weighing the options, mulling it over and over, just STOP! Put a time limit on it. Then make a decision. It doesn’t have to be perfect – you can make adjustments later. Make a decision, take action, make changes if need be, and move forward. No good comes from stewing about it endlessly. Get a Different Perspective From Someone Who Has Your Interests at Heart. I hate to break it to you, but you don’t know everything. Sometimes, getting an unbiased observer to offer their opinion can shed light on things maybe you can’t see. Make sure, if you take someone’s advice, that the person truly cares about you and has your best interests at heart. Don’t make a decision just to please someone else. The goal here is to see more clearly so you can make the decision that is best for you. As best you can, assume the decision has been made, and you’re looking back on how it has affected your life. Do that with each option. What does it look like next week? A month from now? A year? 5 years? Doing this might provide a little extra ability to make a decision. This is similar to the last one. Take 2 options and assign one to “heads” and one to “tails”. Say to yourself, I’ll do whichever one lands face up”. Flip the coin and see which option won. How do you feel? Are you disappointed? If so, maybe you should opt for the other choice. Quite literally, what is the absolute worst thing that can happen? Be honest and realistic. What are the chances of that actually happening? A lot of times, negative consequences of the worst-case scenario may be uncomfortable – but they’re usually manageable. Examine the worst-case for each option, and choose the one you’d be most comfortable with. You can talk yourself out of indecision. Make up a mantra that you can repeat to yourself whenever you’re stuck in indecision, such as “I take action, then I work to make it right”, or “I am perfectly capable of making good decisions”. Make up something that rings true to you and that will help spur you into making a decision. When you can confidently make decisions in a timely manner, you feel better about yourself, you gain the respect of others, and studies show you experience greater satisfaction. Use these tips often until you exercise your “decision-making muscle” and get into the habit of being a decisive person. You can do it!